Skywriters wrote 'America is great! Trump is disgusting' over the Rose Parade on Friday, Jan. 1, 2016. 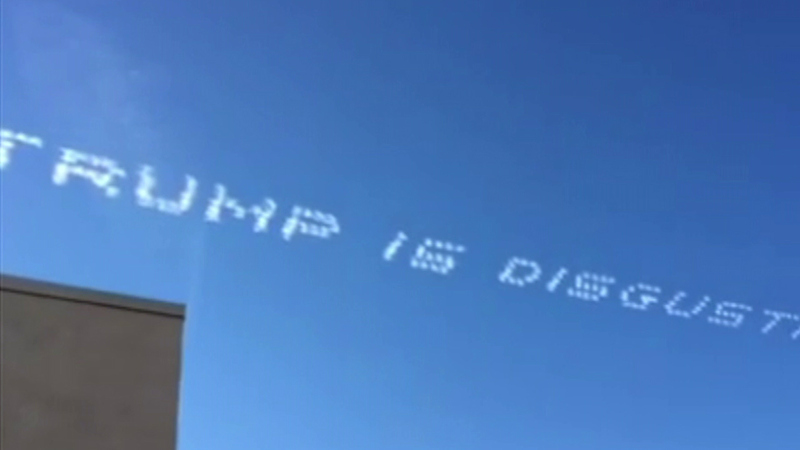 PASADENA, CA -- Skywriters had a very distinct message for Republican presidential candidate Donald Trump at the 127th Rose Parade on New Year's Day. "America is great! Trump is disgusting," was the message sprawled across the sky in Pasadena as floats paraded in front of cheering fans. Skywriters later wrote "Anybody but Trump." The political message was written before Iowa and Stanford faced off in the 102nd Rose Bowl. Iowa is the first caucus state which will vote on Feb. 1. A company by the name AirSign appears to be behind the writing of the anti-Trump messages on Friday. In a tweet, the aerial ad agency said it was paid for by AnybodyButTrump.com, though it appears the actual web address is AnybodyButTrump.us. AnybodyButTrump.us appears to be funded by the We The People Foundation, according to its website.